Having been in the beauty industry for almost 15 years now, I have tried my fair share of products.... most especially facial cleansers. I have used over the counter facial washes, incredibly expensive, anti-aging, mid-grade.....seriously, you name it and I have probably tried it at some point and time. However, I have now been using the same facial cleanser for 2 years and I have no plans on switching. This cleanser always provides an amazingly fresh feel, incredible clean, and manages to replace moisture that I loose throughout the day. It has also now become my 9 year old daughter's favorite face wash too! She has just recently started struggling with an occasional blemish and ever since she began using this face wash, her blemishes have decreased substantially. So what is this amazing face wash? How much is it going to cost me? Both of the answers will most likely surprise you. 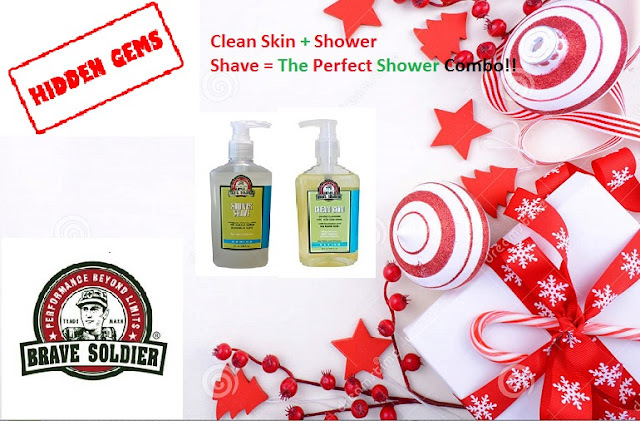 It's the Brave Soldier Clean Skin and it is only $18.00 for 8 ounces!!! That's right ladies and gentlemen....$18!!!! And it only takes a small amount per use too. When it was just myself using the face wash, it would last me for around 6 weeks....now with my daughter and husband using it...well, let's just say it definitely doesn't last as long, but still a completely amazing value. Another hidden gem from Brave Soldier is the Shower Shave. This is another fantastic value at only $18 and I love the fact that it's another product that my hubby and I can share. This doesn't only save us money, but also saves shower space....which can prove to be a challenge. The Shower Shave helps to provide me with an incredibly close shave and leaves my skin smooth and silky. Better yet is that both of these products come in a sturdy and easy to use pump. Want your chance to win a full size Clean Skin for yourself? Simply comment on this blog with your holiday wish and email and we will randomly select a winner....or maybe even two...I am feeling a bit "Santa like" today. Don't forget, if you ever have any beauty questions or concerns feel free to contact our friendly customer service team toll free at : 1-800-926-5219 or over live chat. Until next time.....stay you and stay beautiful!